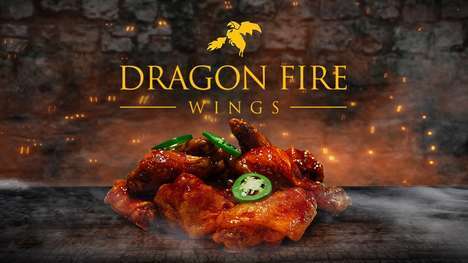 To mark the premiere of the final season of Game of Thrones, Buffalo Wild Wings has created a special Dragon Fire wing sauce. The catch is that this fiery new sauce will be available for just one day only. Inspired by the dark and dramatic Game of Thrones series, the new Dragon Fire sauce combines hot chili and ghost peppers with a savory soy and ginger sauce. The Dragon Fire Wings are also served with sliced jalapenos on top for an extra dose of fire. For those who want to pair the fiery new wings with their Game of Thrones viewing party, the wings will be available exclusively on April 14. Customers can get the wings on-site or for take-out through the Buffalo Wild Wings app or website.